Police officer Stacey Koon declines to answer questions from the media after a bail and custody hearing in U.S. District Court in Los Angeles. Before he became a reviled household name, Sergeant Stacey Koon of the L.A. P.D. had been known largely as a problem solver. Not only had he earned more than 90 commendations, but his investigation and push for the discipline of a white officer accused of excessive force against two black homeless men convinced many of his black peers in the force that he was fully committed to racial equality. But on the night of March 3, 1991, Koon was one of the four officers who attempted to arrest Rodney King after a high-speed chase. Koon took part in the beating, shooting King twice with an electronic dart gun. In his trial, he testified that he felt the force used was properly controlled. Over the next year, Koon, along with Laurence Powell, Timothy Wind, and Theodore Briseno, were acquitted. 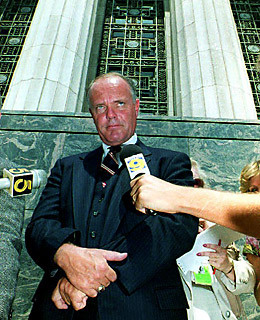 In his 1992 book, Presumed Guilty: The Tragedy of the Rodney King Affair, Koon further defended his actions and blamed the riots on the media and community leaders. A year later, Koon and Powell were retried on federal civil rights charges, convicted, and sentenced to 30 months in prison. Koon was released in 1995, but soon after, an armed man came to the halfway house where Koon was staying in an attempt to kill him. As it happened, Koon was away visiting family at the time, and the assailant, after rampaging through the facility looking for Koon and shooting innocent bystanders, was killed by a SWAT team. Koon eventually moved to suburban Castaic, where he lives on sales of his book. Koon did not respond to TIME's attempts to reach him through his attorney Ira Salzman.